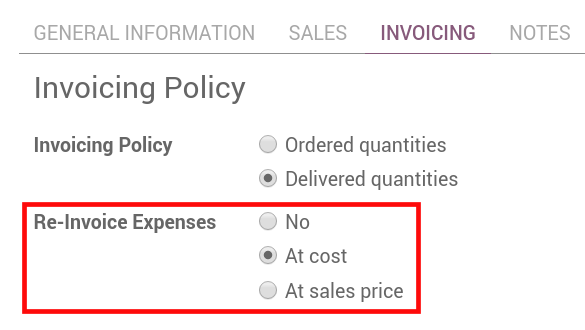 The first step to track expenses is to configure the expense types (managed as products in Odoo) that your company allows, from the Configuration menu. When a specific expense is reimbursed at a fixed price, set a cost on the product. Otherwise keep the cost at 0.0 and employees will report the real cost per expense. How to manage expense in Odoo. Don’t forget to set an expense tax on each expense type (and an account if you use Odoo Accounting). It’s usually a good practice to use a tax that is configured with Tax Included in Price (see: How to set tax-included prices). That way, employees report expenses with prices including taxes, which is usually the expected behaviour. The Sales app allows you to specify unit of measures for your expense types (units, miles, nights, etc.). Go to Sales ‣ Configuration ‣ Settings and check Some products may be sold/purchased in different units of measure (advanced). As an employee (Employee in user access rights), you can record expenses from My Expenses ‣ Expenses to Submit. Select the related product and enter either the total amount you paid (with Quantity = 1) or the unit price if Quantity is countable (e.g. number of hotel nights). Choose if you paid the bill on your own (and expect to be reimbursed) or if the company paid directly (e.g. if you used a company’s credit card). Set the bill reference, add some notes if requested and attach a photo/scan of the receipt from the discussion thread. That will help the manager and the accountant validate it. Let your employees record their expenses from a simple email. Make a snapshot of the receipt and send it by email, or simply forward a bill! The only thing to do is setting up an email alias in Expenses ‣ Configuration ‣ Settings (e.g. expenses@mycompany.odoo.com). For security purposes, only authenticated employee emails (cfr. Work Email in employee detail form) are accepted. The expense product is set automatically if the mail subject contains the product’s internal reference between brackets (e.g. [Food]). Type the expense amount in the mail subject to set it on the expense too. When you are ready to submit your expenses to your manager (e.g. at the end of a business trip, or once a month), go to the menu My Expenses ‣ Expenses to Submit. Select all expenses from the list view and click on Action > Submit to Manager. Save the newly created expense report (i.e. set of expenses), and wait for your manager to approve it. You can also submit expenses one by one from the Submit to Manager button on the form view of an expense. All your submitted expense reports can be found in Expenses ‣ My Expenses ‣ Expense Reports. HR and team managers get an overview of all expense reports to validate from the top menu To Approve ‣ Expense Reports to Approve. Such users must have at least Officers access rights for Expenses. They can review expense reports, approve or reject them, as well as providing feedback thanks to the integrated communication tool. As a team manager you can easily find the expense reports of your team members. You need to be set as manager in the detail form of those employees. To post an expense, a Home Address must be set on the employee. If you get a related blocking message when posting, click the employee, go to Personal Information tab and select/create the contact of your employee in the address book. A contact has been automatically created if this person is using Odoo. You can now see all the expense reports to reimburse in Expenses ‣ Accountant ‣ Expense Reports To Pay. To record the payment or pay by check, click Register a Payment. If you track expenses on customer projects, you can charge them back to your customers automatically. Install Sales app if not yet done. Go to Accounting ‣ Configuration ‣ Settings and install Analytic Accounting* (in Recommended Features). At cost: will invoice expenses at their real cost. At sales price: will invoice based on a fixed sales price defined in the product form. As a salesman, create and confirm a Sales Order for the services delivered to your customer. Don’t put any expense in the order. They will be added automatically once posted by the accountant. Link this order to an analytic account dedicated to the customer project. You can create it on the fly. 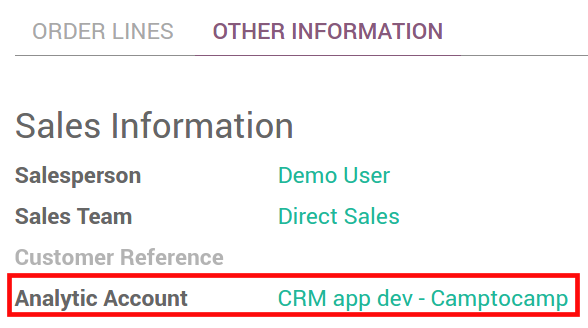 If you track Timesheets on customer projects, Odoo can create an analytic account automatically once the order confirmed. It’s useful if your employees must record timesheets on customer-specific projects. To do so, open your order product (service item) and make sure Track Service is set on Timesheets on project. As a manager, make sure the analytic account is set on every expense line on approving expenses reports. Click the line to add one if missing. Employees are already able to set one when submitting. As an accountant, post journal entries. Now you can invoice the order.It shows up in Sales ‣ Invoicing ‣ Sales to Invoice. The expenses have been added automatically in the order lines. Such items show up in blue (i.e. to invoice).